We are, it seems, surrounded by all kinds of wildlife. This may look like a fearsome creature from the black lagoon. But I’m pretty sure it’s only a rough-skinned newt. At least that’s the conclusion I reached after consulting The Oregon Encyclopedia, an online project of the Oregon Historical Society. Newts are a kind of salamander. The description — up to eight inches long, large head with a blunt nose, color mostly black, leathery skin with a “granular or warty texture” — seemed to fit. The color of their underside is supposed to be yellow to orange, but this guy didn’t turn upside down so I could check, and I figured it would be impolite to flip him on his back. The online fact sheet says the newts’ skin contains a powerful poison to protect them from predators. Glad I didn’t pick him up. Newts are supposed to live in forests that contain lakes and ponds. I don’t know what this fellow was doing on our concrete driveway, which is nowhere near a pond, let alone a lake. Garter snakes are said to be “significant predators” of newts. The little snakes have developed an evolutionary defense against the toxin. So it’s a good thing for this newt that the garter snake I photographed in July has not been seen since. 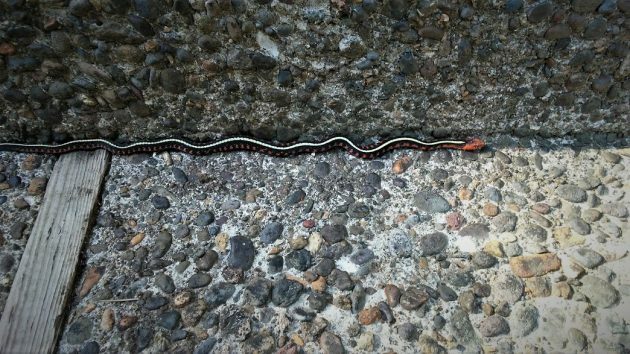 A garter snake below the front steps. Around here you never know what animal will cross your path next. Wasn’t he the Speaker of the House? How the mighty have slithered. He was, and deserved to be, because he was the smartest person in almost any room (my own lame opinion). But then he played a huge role in creating the polarization that may yet destroy the country. Slithered, indeed! Oregon rough skinned newts are not poisonous to touch or handle. However do not eat them, you will die. Every person I know that is a coastal native played with them growing up. We aren’t dead or affected by handling them. But there were some university of Oregon fraternity boys that were drinking and on a date swallowed 3 alive newts. The three boys all died in a short amount of time. “…  university of Oregon fraternity boys …” has a ring of urban myth to it. From a reasonable search effort, it seems that “Oregon” and “drinking” are true; the number is one, not three; can’t find anything about “university” or “fraternity.” If anyone knows otherwise, please provide a source. I love creatures, big and small. I like the newt at your house much better than the speaker, Newt (homo-sapien species). I’ve only seen one garter snake at my house in 22 years I’ve lived here. Used to see them all the time when I was a kid here in the Valley.